Frontera Farmer Foundation is a Chicago-based nonprofit that reflects the commitment of Chef Rick Bayless and his Frontera restaurant group to help local and regional farmers build their businesses and succeed. The foundation makes grants to small farms to help them with operational needs and, in many cases, to scale up and help expand the market for Good Food in the Chicagoland area. 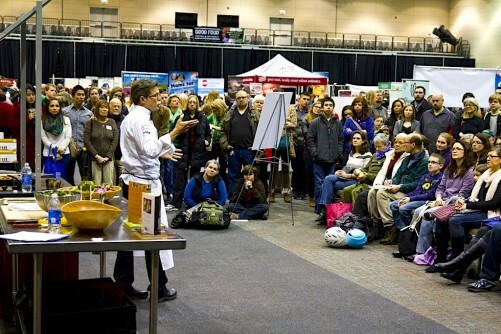 Chef Rick Bayless, whose restaurant group established the Frontera Farmer Foundation, is a frequent participant in FamilyFarmed’s annual Good Food Festival & Conference. 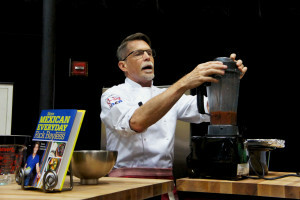 This year he conducted a demo at the March 26 Good Food Festival of a recipe from More Mexican Everyday, the most recent in his long lineup of cookbooks featuring regional Mexican cuisine. In the following article, Casey Cora of the Frontera Farmer Foundation presents the lineup of its 2016 grant recipients, and we are very pleased to see many friends and associates of FamilyFarmed… including two graduates of the first (2014-15) class of our Good Food Business Accelerator program: Mint Creek Farm and The Urban Canopy. Good Food on Every Table wrote a feature piece last May about Rick Bayless’ efforts, over his nearly 30 years as a Chicago chef, to help establish and grow the market for locally and sustainably produced food in the Chicago foodshed. Click here to read all about it. The renovation of a dilapidated hog barn, the creation of a mobile goat milking parlor and the purchase of a supercharged egg washing machine are just a few of the projects that will be funded in 2016 with grant money from the Frontera Farmer Foundation, a nonprofit started by Rick and Deann Bayless and the staffs of Frontera Grill and Topolobampo. Since its inception in 2003, the foundation has awarded nearly $2 million in grants to small Midwest family farms. It’s an effort to help local farms and to highlight the vitality of Chicago’s culinary culture in restaurants, CSAs and farmers markets. More about the Foundation. This year’s crop of winners are using the small capital development grants for projects big and small, each offering the farmers a chance to expand their operations. 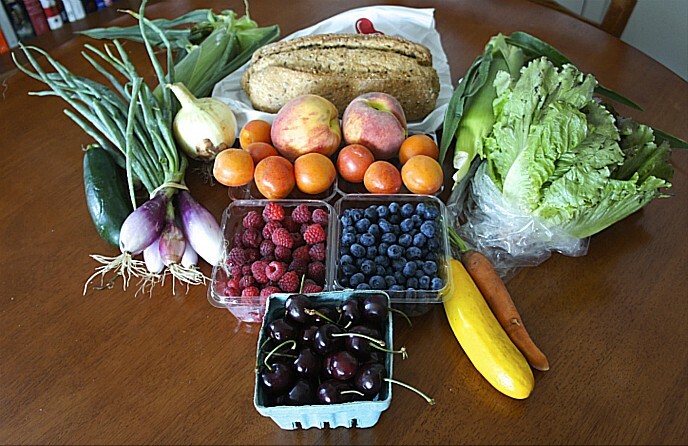 All will increase the availability of Good Food in the Midwest. It is with great pleasure that we announce these 16 winners of the 2016 grants. Project: Construction of a new packing shed, where all produce will be cleaned, packed and stored, and where washing equipment, coolers and CSA boxes will kept. Project: A mobile goat milking parlor to aid this micro-dairy in producing farmstead cheese and other dairy products from sustainably raised goats. This map of the 16 recipients of this year’s Frontera Farmer Foundation grants shows the farms are most heavily concentrated in the Chicago metropolitan area and parts of northern Illinois and southern Wisconsin that provide much of the fresh, regionally produced food for the Chicagoland market. Project: Chicken housing for winter and a new egg washing machine capable of washing 1,000 eggs in an hour, rather than the 120 eggs per hour done by hand. Together, the projects are expected to enable the expansion of the farm’s flock of laying hens from 750 to 5,000 birds. Building a new cold storage, indoor loading and processing shed and retrofitting two greenhouses with solar heat storage. Project: Construction of two high tunnels for the early production of tomatoes, peppers, cucumbers and carrots, and winter production of leafy greens, brassicas and root crops. This entry was posted in Chef advocacy, Community Supported Agriculture, Cookbooks, CSAs, Direct Farm Marketing, Family Farms, Farm businesses, Farm to table dining, Farmers markets, Financing, Food Entrepreneurs, Frontera Farmer Foundation, Good Food Business Accelerator, Good Food Festivals, Regional food systems and tagged Chef Rick Bayless, FamilyFarmed, Frontera Farmer Foundation, Frontera Grill, Frontera restaurant group, Good Food Business Accelerator, Mint Creek Farm, Rick Bayless, The Urban Canopy, Topolobampo. Bookmark the permalink.